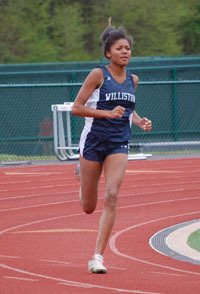 Sophomore Gabby Thomas had another outstanding day at the NEPSAC Division II Track and Field Championships held at Williston Northampton School this past Saturday. Her top finishes earned her All New England recognition in four events, and included a record-setting run. In the 100 meter dash, she earned her third straight NEPSAC title with a final time of 12.06, breaking the NEPSAC Division II record of 12.31. 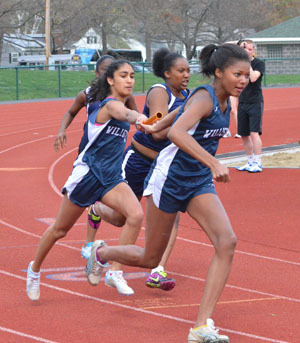 Hers was equal to the fastest electronically timed 100 meter dash in a NEPSAC championship meet at any level. Ms. Thomas also had a second place finish in the triple jump with a jump of 36’ 6” and a fourth place finish in the long jump with a leap of 17′ 5″. Along with teammates Rachel Rockwell ’16, Jen Carellas ’15, and Lena Gandevia ’15 Ms. Thomas anchored the 4 x 100 relay team that finished in third place. 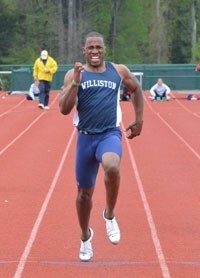 Ms. Thomas is Williston’s record holder for the long jump, triple jump, and 100 meter dash. Read the article about her achievement on Masslive.com. Three Williston athletes emerged as New England Champions at the NEPSAC Division II Championships held this past Saturday at Governor’s Academy in Byfield, MA. Senior Daniel Rowe won the 100 meter dash in a photo finish with a time of 11.20 sec. Rowe also finished second in the 200 meter dash in 22.70 sec., which ties the school record set in 2005 by Sidney Baptista ’05. 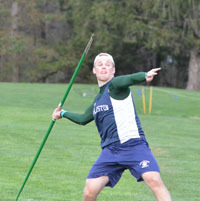 Senior Joey Holleran finished first in the javelin with a toss of 157′ 2″ to claim a New England title. 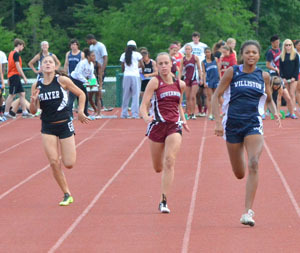 In the girls’ meet, freshman Gabby Thomas successfully defended her New England title in the 100 meter dash with a time of 11.43 sec. Thomas also won the long jump with a leap of 17′ 7.25″, which is also a new school record. The previous record, set in 2007, was held by Annie Huyler ’08. Freshman Gabby Thomas set a new school record in the triple jump on Wednesday with a leap of 35′ 6″. The previous record of 33′ 10″ was held by Annie Huyler ’08. Thomas, who is the defending NEPSAC Div. II 100 meter champion, also won the high jump and 100 meter dash and was a member of the winning 4×100 relay team in the team’s win over Cheshire Academy. The captain of the wrestling team, Sam had an outstanding day on Saturday at the team’s senior day as they faced Deerfield, Pomfret and Suffield. Sam pinned all three of his opponents to help his team to a 2-1 record on the day. Coach KaneLong has been impressed with the level of leadership that Sam has provided all season long. Jen is off to a strong start for the girls’ varsity ski team. 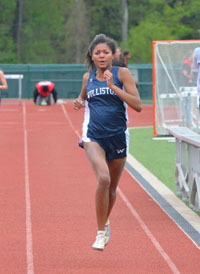 On Wednesday she finished second for Williston and 13th overall in the team’s first race of the season. Jen has been working hard at every practice and has been supportive of her teammates. Gabby has helped the girls jv basketball team get off to an outstanding 4-0 start to their season. Last week Gabby scored 39 points in the team’s 69-30 win over Berkshire School.